Handy Handout #227: Language Expansion vs. Language Extension—What’s the Difference? Language Expansion vs. Language Extension - What's the Difference? Young children and children with disabilities often use simple language to express themselves. They are learning to use more "grown-up" language which they hear from older siblings, friends, parents, and teachers. Language expansion and language extension are two ways for you to help children develop their expressive language skills. Language expansion "expands" a child's utterance-when talking with a child, use adult grammar but do not add new information. Language extension "extends" a child's utterance-when talking with a child, use adult grammar and add new information. 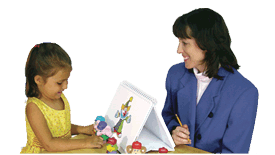 Both techniques require the use of a good speech model when talking with young children. Repeat the child's simple sentences in the manner in which an adult would say it, by completing and/or adding to his/her expression. This adult model helps the child learn vocabulary, grammar, stress and inflection, and expressive language skills. Expansion: Expand the child's "sentences" to the way an adult says them. Restate and complete the child's utterance. This gives the child a good speech model for reinforcement. For example, the child says, "Doggy run," you say, "Yes, the dog is running." The child says, "Him hurt?," you say, "Is he hurt?" Extension: Extend the child's "sentences" to the way an adult says them, then add an additional, related comment. For example, the child says, "Car go," and you say, "The car is going. It's a red car." The child says, "Baby cry," and you say, "The baby is crying. He's hungry." Where Can I Practice Expansion and Extension With My Child? Grocery Store - As the child talks about items in the grocery store, he/she says, "Juice." The adult expands the utterance and says, "Yes, that is juice." The adult extends the utterance and says, "Yes, that is juice. It is apple juice." Riding in the car - The child sees a person riding a bike. The child says, "Boy on bike." The adult expands the utterance and says, "The boy is riding his bike." The adult extends the utterance and says, "The boy is riding his bike. He is riding on the sidewalk." Retail stores - The child is in the toy section of the store and says, "Basketball." The adult expands the utterance and says, "That is a basketball." The adult extends the utterance and says, "That is a basketball. You bounce a basketball." Playground - The child plays on the playground and says, "Big swing." The adult expands the utterance and says, "Yes, that is a big swing." The adult extends the utterance and says, "Yes, that is a big swing. It is a green swing. It goes back and forth when I push you on it." Morning time/getting ready - Child says, "Brush teeth." Adult expands and says, "You are brushing your teeth." Adult extends and says, "You are brushing your teeth with your blue toothbrush." Bath time - Child says, "Wash hair." Adult expands and says, "I will wash your hair." Adult extends and says, "I will wash your hair. I will use shampoo." Dinner time - Child says, "More cookies." Adult expands and says, "Do you want more cookies?" Adult extends and says, "We have chocolate-chip cookies." Playing outside - Child says, "Fall down." Adult expands and says, "You did fall down." Adult extends and says, "You did fall down. You fell down in the sand." Teachers, speech-language pathologists, parents, etc., can make a big impact on helping children improve their vocabulary, grammar, speech, and expressive language skills. Providing a good speech model for young children and children with disabilities helps them to become more familiar with the things around them in their natural environment and encourages them to use more "grown-up" language when expressing their thoughts and ideas.